All Tripawd cats dogs need outdoor adventures. But for dogs, keeping up with the rest of the pack can be a challenge. That’s when this collapsible ATV pet wagon comes in handy! This off-road pet wagon holds up to 150 pounds! ♦ Go on shorter, more frequent walks throughout the day. 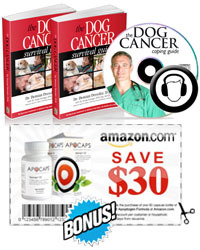 ♦ When fully recovered, a Tripawd’s walk should be no more than 15 or 20 minutes, maximum. 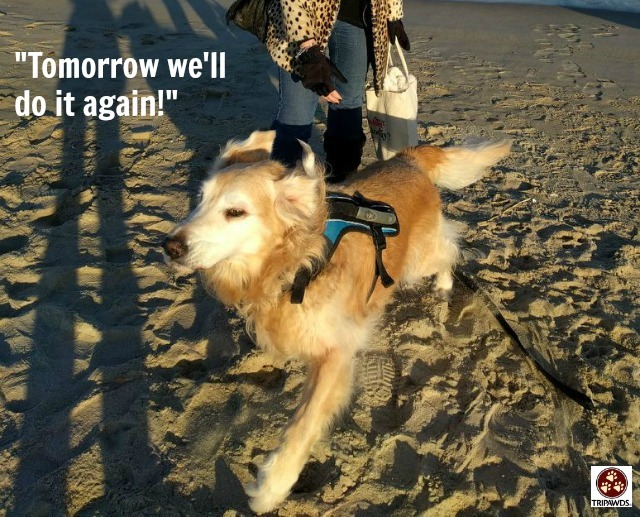 Of course we all want our Tripawds to come along on our adventures that take longer than 20 minutes. In the city, a pet stroller is a logical choice. Tripawd pet strollers are available for all sizes of pets from small to large. But there is a downside: the pet strollers we’ve discovered aren’t easy to use on dirt and sand. When you want to hit the beach or hike the mountains, this off-road collapsible pet wagon can do the trick! Make your walk to the location easy peasy for your Tripawd hero. When you get there, that’s when the fun begins! A pet wagon can keep the pack’s adventures going. Just ask Henry’s Mom! She purchased one for her family’s annual beach reunion last fall. With thanks to Ellie and Henry for this endorsement! 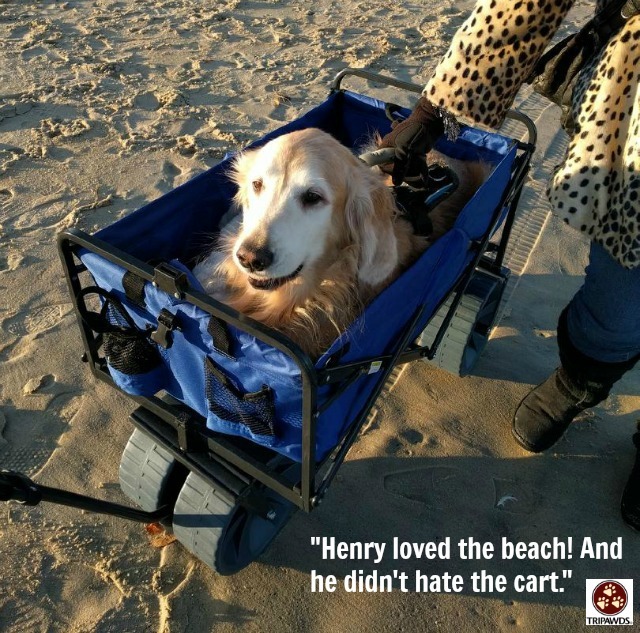 The first time out, don’t expect your Tripawd to jump into the collapsible pet wagon and say “Let’s roll!” Many dogs are apprehensive about riding in one — at first. In the excellent VetStreet article “Teach Your Dog to Ride in a Stroller” by Fear Free™ trainer Mikkel Becker, she advises pet parents to introduce pet strollers slowly. “Introduce the stroller at home. Bring the stroller into your house or backyard, someplace with minimal distractions; secure the wheels so that they won’t move. Either pick your dog up and place him in the stroller or lure him in with a treat. Make sure your dog is secure. When you take your dog out in a stroller, make sure he is appropriately secured, to prevent him from running away if he falls or jumps out of the stroller. Start out slowly. Some dogs may be nervous when the stroller starts to move. For this reason, only push or pull your pooch a few inches to start, and reward him with praise and treats for remaining calm. How do you get your dog into the wagon if you can not pick him up? Good question! Consider crafting a ramp, or post in the discussion forums for much more feedback from members than you will get here.